People have long faced nuisances from marketers and advertisers in their lives: telemarketing calls during dinner, purposely loud and obnoxious commercials interrupting TV shows, or piles of mailers that usually go straight into the recycling bin. These types of advertisements, which push products and services onto unwilling consumers, have been joined by a new breed of ads that exist solely in the digital marketplace. Think pop up ads, distracting banner ads, or the dreaded auto-playing video ad. At HubSpot, we wondered: What type of customer experience do these online ads create? How do they affect a brand’s reputation? And most importantly, how should marketers engage consumers with ads in the future? Given today’s rapidly changing advertising landscape, the ramifications for marketers are clear: As more consumers ignore or even remove themselves from receiving interruptive ads, advertising needs to evolve. Ads will never disappear. But as consumer behavior changes, marketers need to get smart about their digital ad spend. In the near future, marketers who want to connect with potential customers must supplement their target’s online experience, not interrupt it. Conclusion: Is This The Age of Native Advertising? That’s great for the marketers behind the ads, right? Not exactly. Yes, ads are getting a lot of eyeballs, but what type of experience do they generate? Let’s break down the experience ratings for each type of ad. Consumers really hate telemarketing calls; pop up ads; and autoplaying video ads. If you’ve encountered these in the past, it hardly needs to be explained why people react so negatively to them. Let’s focus on the best-rated types of ads instead (see Figure 3). 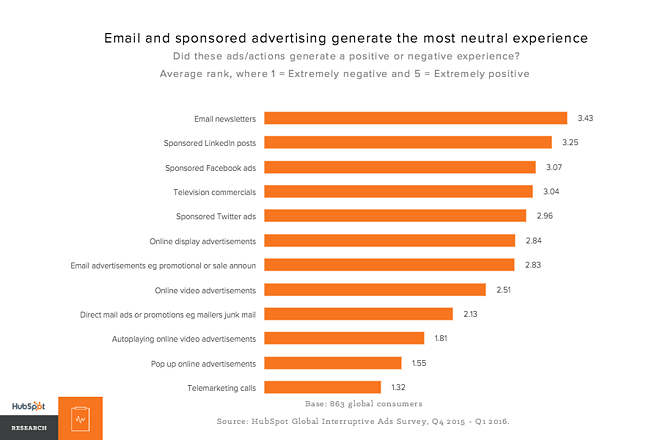 No ads received a positive response, but when you look at the neutral responses a common theme emerged: Ads with neutral experience scores are either expected or do not disrupt a consumer’s browsing experience. Email newsletters and email ads are unique forms of advertising that consumers have opted into. They’re promotional assets that a consumer can choose to read or ignore. They include the option to unsubscribe from mailings completely. The control is all in the consumer’s hands. The next set of ‘neutral’ ads is sponsored content that appear in LinkedIn, Facebook, and Twitter, which fall into the broader category of native advertising. 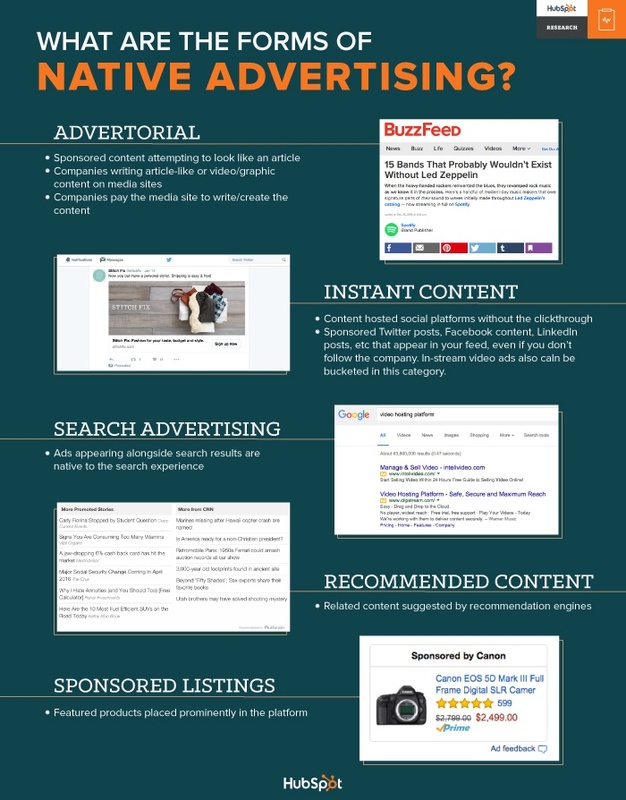 Defining native advertising is tough, but native ads typically match the look and feel of the platform it appears in and provides *useful* content rather than a typical CTA to purchase something. Considering the behavior the previously mentioned social networks encourage -- fast consumption of information through a scroll down gesture -- it’s easy to see how a sponsored ad appearing natively in-platform creates an unobtrusive experience. In fact, viewers often don’t notice the difference between a well crafted native ad and a standard post or listing in the platform. There is also less risk of damaging a brand’s reputation if marketers choose to go native (see Figure 4). 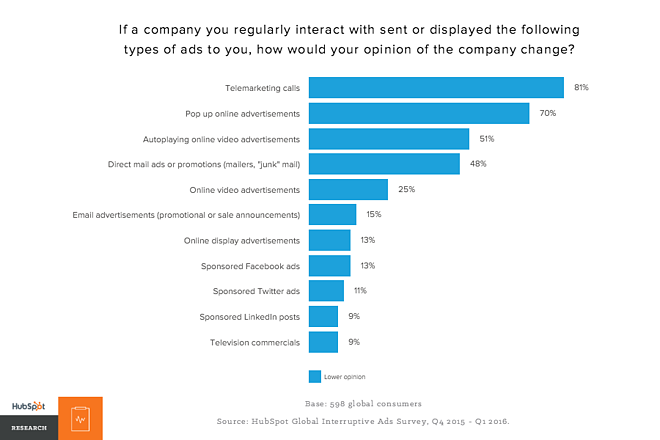 Opting for telemarketing calls, pop up ads, or autoplaying ads can do real damage to your brand’s reputation, with 72% of respondents indicating they would have a lower opinion of a brand if they subjected the consumer to a pop up ad. Consider: for every successful conversion you may get via a pop up ad, how many potential customers did you put off? Inbound marketers have long known that power has shifted to consumers. The same is becoming true of ads as well. Consumers today are taking charge of their experience and avoiding interruptive advertising. They are unsubscribing from emails, skipping commercials, ignoring phone calls and direct mail, closing webpages, and, most troubling to the ad industry, blocking online ads. 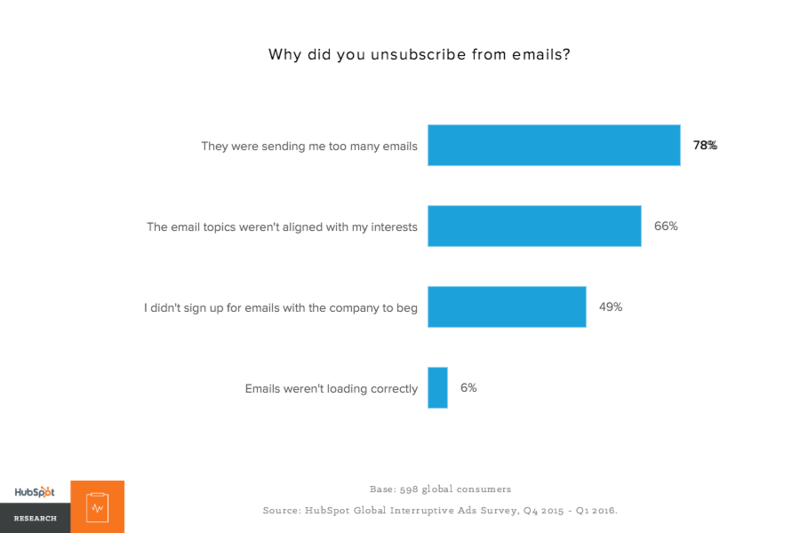 In our study, 96% of consumers have unsubscribed from receiving emails (see Figure 5). The top reason was the sheer volume of emails being they were receiving from a company. A worrying 52% also indicated they didn’t sign up for emails to begin with. With CAN-SPAM laws long in effect, it’s more likely that the respondents 1) forgot that they signed up for emails or 2) didn’t realize they were going to receive emails when they submitted personal information to a website. Marketers have long used email sign up as a key metric for marketing success. But if email recipients (who don’t even remember signing up for emails to being with) just end up becoming inactive or unsubscribing, is that metric really meaningful? Email may produce a neutral experience but that doesn’t mean marketers should send irrelevant emails to inactive email addresses. Most consumers have reached a saturation point on the emails they’re willing to open, much less receive. Email nurturing should evolve so that marketers focus on getting targeted content to engaged leads and delighting your customers, not on the sheer size of their email database. To drive real engagement, marketers can send contextual emails to their database using more granular segmentation, personalize their messages, and of course, make sure the content of the email is stellar enough to warrant a open or a click. 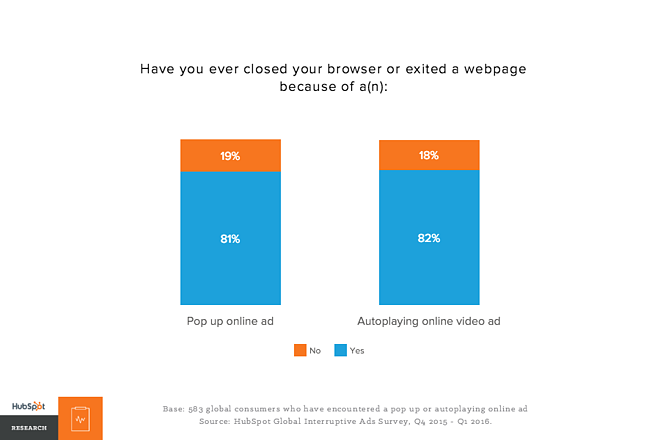 Four out of five consumers have closed a browser or exited a website because of an autoplaying ad or a pop up (see Figure 6). So not only does the marketer’s paid advertisement not connect with a consumer, the web host of the advertisement also loses a visitor. Coupled with the generally negative reaction consumers have for these types of interruptive online ads, it really seems like a lose-lose option to pursue. Ad blockers are applications (like plugins or browser extensions) that remove or alter advertising content on a webpage -- when a user loads a web page, the ad blocker application compares the scripts that load against its own database of scripts that it is designed to block (see Figure 7 for a simplified diagram). If there’s a match, the ad on the page gets blocked. The majority of ad blockers target banner ads and pop up ads, and many block native and search ads as well. Some completely remove all advertising from a page while others focus on ads that compromise privacy by blocking tracking codes. 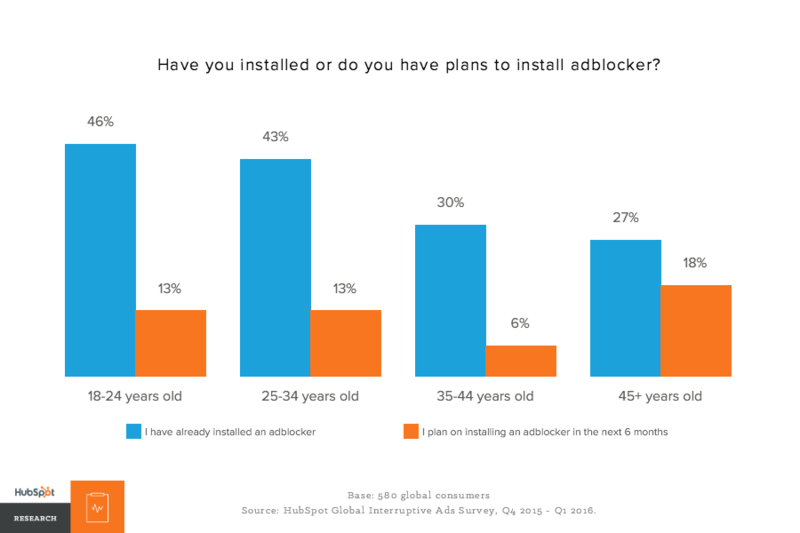 Over half of our respondents have installed an ad blocker or plan to install one within 6 months (see Figure 8). Generationally, adoption is highest amongst millennials. Adblocker Plus, the most popular ad blocking app, has reached 300 million downloads worldwide, causing traditional advertisers to reach near hysterical levels of panic. The reaction is understandable, given that ad blocking has cost publishers nearly $22 billion in 2015 alone. People now spend 51% of their time accessing the internet via mobile devices. Ad block tools have been available on Android and IOS mobile devices, but this year, Apple announced that IOS 9 will allow ads to be blocked in its Safari browser and within apps. The implications are huge: 20% of all web browsing happen in Safari. People spend 85% of their mobile time in apps. Apple’s IOS announcement means advertiser’s access to both Safari and apps will be cut. 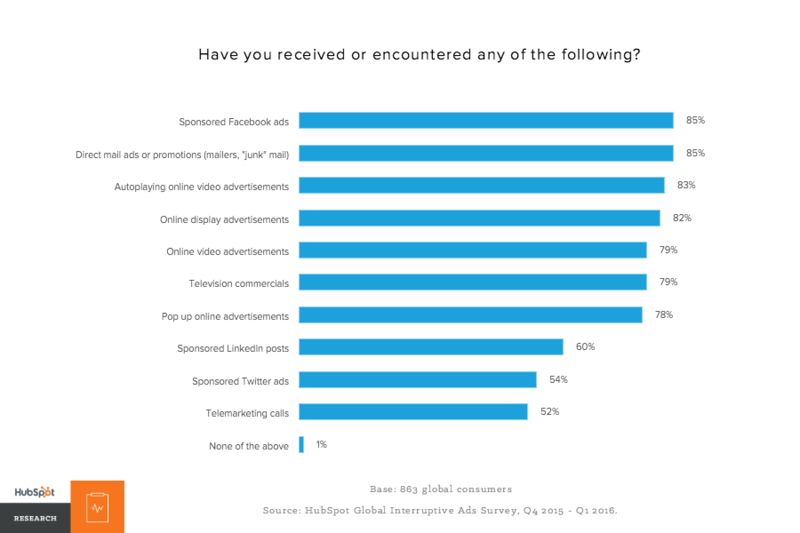 Display ads have long been the bread and butter of most online advertisers. Now that millions of consumers are blocking them, marketers who still want to use paid advertising online must be smarter about the content they create and the channels they use to distribute it. Is this the age of native advertising? Platforms are aggressively pushing out content. Consumers are sick of interruptive ads. What does this mean for the future of advertising? HubSpot found that there is a clear preference for native advertising amongst digital consumers while ads that interrupt (pop ups, auto-playing videos, etc) are the lowest rated. To make your ads less interruptive, use unobtrusive formats like native ads. While traditional advertising channels will never disappear, marketers must begin factoring in native into their overall marketing strategy. 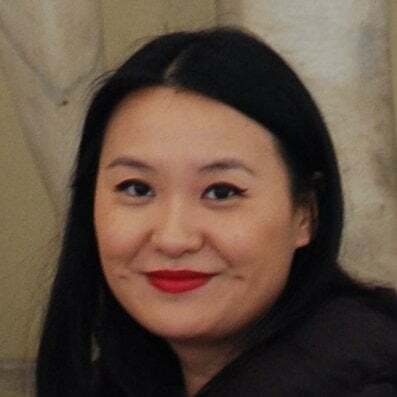 Native ads can be sponsored tweets on Twitter, promoted listings on Amazon, or ‘advertorial’ content published on sites like BuzzFeed. 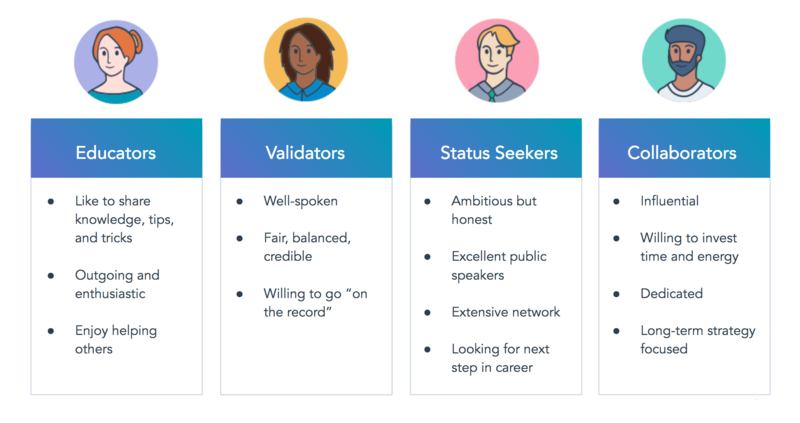 The content can be written by the publisher’s staff or by the sponsor company (see Figure 9 for a breakdown of all the types of native). For years, many industry analysts have been heralding the rise of native advertising. The shift to native appears to be accelerating as platforms have amped up their focus on advertising in-platform. Besides the social networks mentioned previously, publishers like BuzzFeed, Snapchat, and even Netflix have placed bets on ads within their platform this year. Facebook, beyond their business line of targeted advertising, even announced intentions to co-opt traditional news media. As various platforms demand the ability to host an advertiser’s content natively rather than linking to a separate web property, there are huge ramifications on how marketers do their work. Marketers interested in targeting ads to specific consumers in an unobtrusive fashion should seriously consider spending some time on native. There are downsides: in exchange for delivering a better ad experience, hosting content on a third party platform -- usually in the ‘advertorial’ use case -- means a marketer will have spotty access to metrics that prove an ad campaign’s success. After spending years figuring out how to tie together metrics from content marketing via tracking click-throughs, it will be disheartening for marketers to face the loss of control over data when switching over to native. However uncomfortable this shift to platform hosted content may be for marketers and advertisers, our sentiment data clearly show that these platforms have a good reason to bet on native advertising--people don’t hate it. It’s in the marketer’s best interest to pursue advertising that is not disruptive to their intended target, even better, caters to the content needs of users. Ensure your targeting is focused. Most importantly, your ad’s creative content must be relevant and remarkable to your audience. HubSpot fielded a global online survey from December 2015 through January 2016. The survey was translated into Spanish and Portuguese. The responses were sourced through via email invitations, blog promotion, and social sharing. No personal information was collected and no incentives were offered.